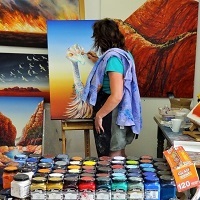 Linda has a number of educational videos on YouTube to help you learn various acrylic painting techniques. Learn about Using Cracking Medium to create a faux distress frame on canvas, using Rusting Mediums, Painting a Blended Background as well as some complete step by step painting videos. Subscribe to her YouTube channel to get updates when a new video is released.